A new expansion is upon us, which means theory-crafting season in full swing. While we don’t know just yet which decks will be considered top tier, Bomb Warrior is an archetype that appears to be in the running. During the tail end of Rastakhan’s Rumble, the Warrior class started seeing significant play for the first time in a while. Unfortunately, this was due to the success of Odd Warrior, which is no longer available in Standard play. Luckily for Warrior fans, however, the class is far from dead. Thanks to the Rise of Shadows expansion, we now have Bomb Warrior. If you haven’t yet had the pleasure of playing against the deck, you may be a bit confused by its name. Bomb Warrior is focused around a number of cards that forcefully shuffle a bomb into your opponent’s deck. The bomb enters your opponent’s deck in the form of a card called “Bomb” and is automatically cast when drawn. The bomb causes the person casting it to take five damage. The idea is to use a variety of control-oriented cards to hold off your opponent’s threats while you simultaneously shuffle bombs into their deck. 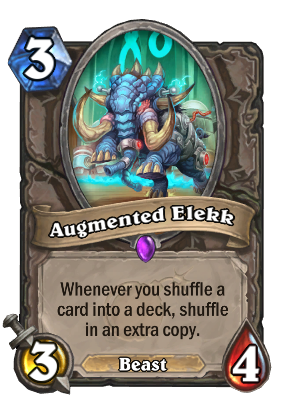 Although there are a number of different packages that can be used for bomb generation, one thing they all have in common is how well they synergize with Augmented Elekk. This card is a three-cost 3/4 Beast with an effect that compliments Bomb Warrior perfectly. When Augmented Elekk is on the field, anytime you shuffle a card into a deck, you shuffle an extra copy. 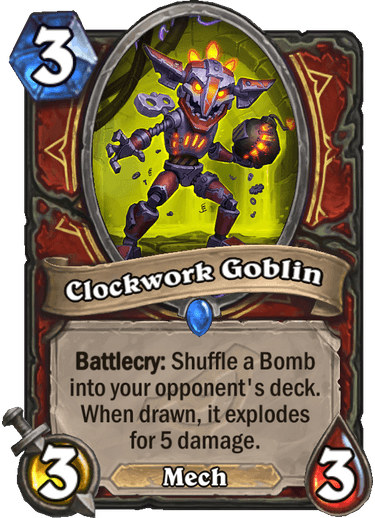 This means anytime you use a card like Clockwork Goblin or Wrenchcalibur to shuffle a bomb, you’ll be getting double the value. Since the archetype is so efficient at bomb shuffling, many of your games will be won by slowly watching your opponents draw themselves to death. Although this is the primary win condition of the deck, it’s not the only one. Bomb Warrior also comes equipped with the new Blastmaster Boom Legendary minion. 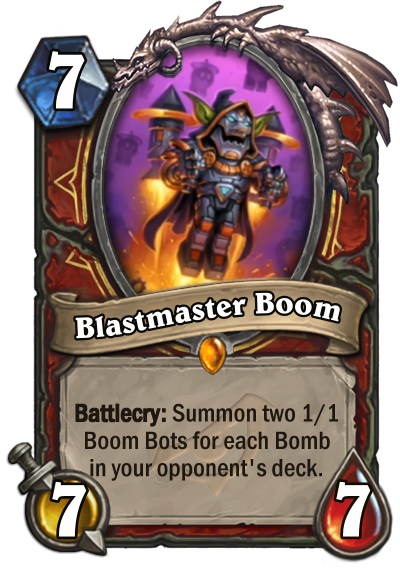 Blastmaster Boom is a seven-cost 7/7 minion with an effect that gives you insane value based on the amount of bombs in your opponent’s deck. For each bomb in their deck, Blastmaster Boom summons two 1/1 Boom Bots. These tiny Bots are 1/1 Mechs that deal one to four damage to a random enemy upon death. A board full of these followed by a Brawl means your opponent is about to take a ton of Bomb Bot related damage to the face. This combo can be used to regularly close out games, as long as you’ve shuffled enough bombs into your opponent’s deck. 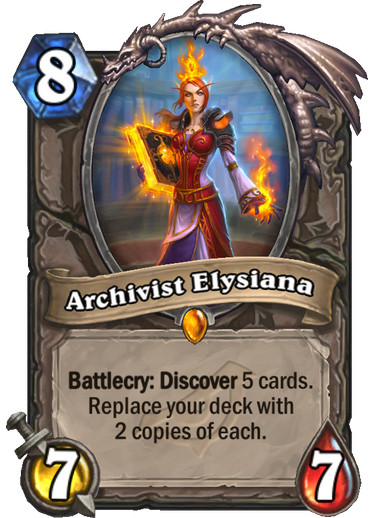 As if the bomb squad wasn’t enough, many Bomb Warrior lists have also chosen to run the new Legendary Minion Archivist Elysiana. This card is an eight-cost 7/7 neutral minion from Rise of Shadows with one of the most interesting effects in Hearthstone today. Elysiana’s Battlecry allows you to discover five cards and replace your deck with two copies of each. While this effect may seem detrimental to your deck’s strategy on the surface, the value comes in knowing when to play the card. If you play Elysiana when you’re close to running out of cards while waiting on your opponent to draw bombs, suddenly you have a fresh set of cards saving you from fatigue damage. Not only can she save you from fatigue, but Elysiana is also great against the Bomb Warrior mirror match. If you’re low on cards and there are a few bombs waiting to blow you away, Elysiana can eliminate that threat and keep you in the game. As far as your mulligan goes with Bomb Warrior, you’ll be looking for a few different cards early on. Always keep Eternium Rover—he provides good early game board presence and punishes your opponent for using any sort of single damage burst AOE. 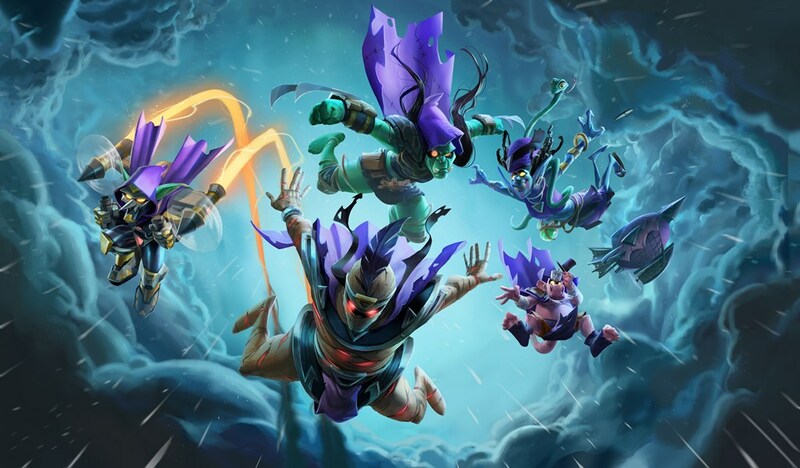 You’ll also be looking for Clockwork Goblin, Augmented Elekk, and Wrenchcalibur. These cards are essential parts of your bomb-shuffling strategy, but they do cost a bit more mana. Be cautious of keeping these cards if you don’t have an Eternium Rover in hand. Since there are a number of different Bomb Warrior lists seeing success right now, it would be impossible to feature them all. The list below takes advantage of the packages discussed above while swapping out certain high-value Legendaries. These lists should give you a foundation to build on as you try to make your own version of the deck using what’s available in your collection.